This ultra-thick cover offers a high grade protection for you outdoor lounge chair. Featuring a tough material provides full protections which effectively prevents the damages of your lounge chair from exposing in bad weather condition. Specially to fit all weather conditions: snow, sun exposure, sleet etc. Reliable protective cover to keep a new looks for your lounge chair throughout the seasons. With durable 210D Oxford fabric, this cover protects against rain, snow, sun and dirt and won't crack in cold weather. 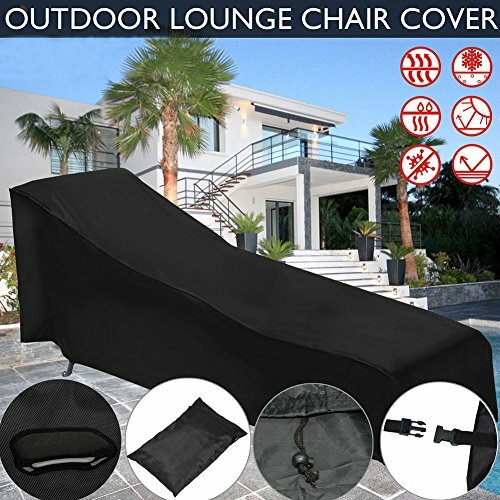 The bottom of the cover has a drawstring so that you can synch it up nice and tight, ensures this outdoor furniture cover is good in windy conditions. Fit most outdoor lounge chair. Come with a storage bag for easy storage.